You know how people say the human want is insatiable?, well I just had that moment a few minutes ago. I always try my best to be unique and distinct in things I do, my brother says I’m paranoid I do not agree in my defense, its my quest for perfection. I have received a few compliments on my blog layout(thank you) but trust me, I had to search hard to find such a beautiful free template. When I started blogging, I used my ipad for my pictures, I had no idea about lighting,editing ,composure etc. I later began to develop in that field(photography) I bought a point and shoot camera, then a bridge camera (which I currently use) , sometimes my phone and now I’m thinking if I get a DSLR, my pictures will be perfect. In all what I’m saying is that as humans and as bloggers we unconsciously grow and get better at things. Change is constant, just take life one step at a time and you will be surprised how far you have come. I had a meeting yesterday on the island but unfortunately missed my way and hence I got there super late( lagos struggle). Of course the meeting had to be rescheduled and I ended up dicovering new places and also took pictures of my outfit. I love peplum and the illusion it gives every body type, I have mentioned this is a previous post. The uniqueness with peplum is that if you are struggling with belly fat like me, it takes the eyes off that insecurity and places the eyes on your newly found curves. For a simple look I decided to keep everything basic with shades of cream and black while making the blazer bright coloured to grab all the attention. To finish off I went for a super light, easy to wear pair of sandals and bam! the look is complete. Great top and smile, have a lovely new month! I love your peplum blouse, and I also love the look of the white jeans you styled it with. The shape colour, print, and white trim at the hem of the peplum blouse are all pretty. You look fabulous. Thank you Blogoratti. U too! Lovely outfit. Seems u really love peplum. I also love ur blog layout. 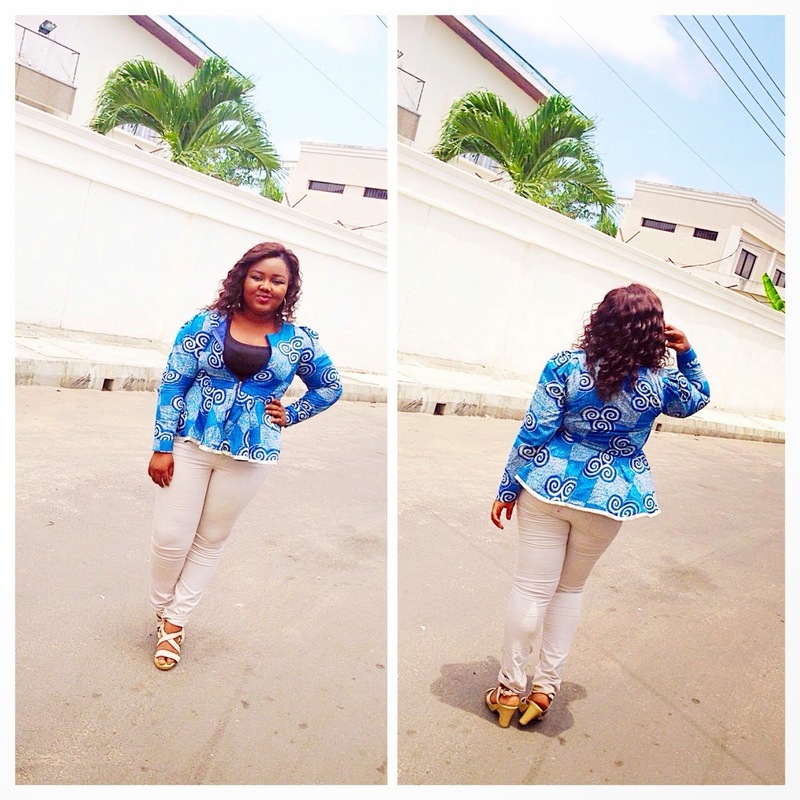 Love your african print blazer! Thanks dear, yes I do love peplum, I have a ton of them.